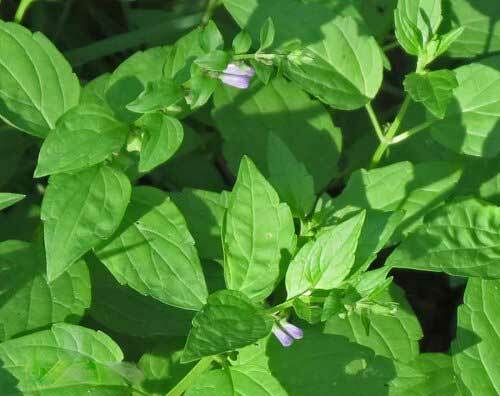 Skullcap is a hardy, long lived herb that loves wetlands and grows up to 80cm in height. Skullcap is a flowering plant from the mint family, its name refers to the shape of the flower from the Latin ‘scutella’ meaning small dish. Some evocative old names for Skullcap were ‘Mad-dog Skullcap from when it was used as a remedy for the bite of a mad dog (from rabies) or Madweed from the practice of using Skullcap for extreme mental disorders. 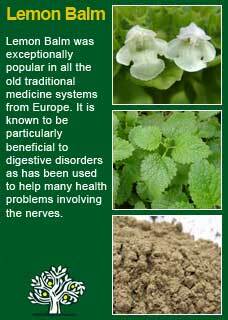 T. Bartram calls Skullcap one of the most widely used of herbal medicines and he describes its actions as 'antispasmodic, anticonvulsive, relaxing nervine, brain & CNS vasodilator & sedative. He says it is good for 'migraine, premenstrual tension, headache, disturbed sleep, nervous stress following bereavement or shock' and that it is 'a supporting nervine for workaholics compelled to work long hours with resulting mental exhaustion' and that it can help in the withdrawal of benzodiazepines (Valium type drugs) He suggests doses of 1-2 grams or equivalent in fluid form. The British Herbal Pharmacopoeia (BHP) describes Skullcap's actions as anticonvulsive & sedative and says it is indicated for epilepsy & nervous tension states. The BHP suggests a dose of 1-2 gms or by infusion and suggests a tincture in the ratio of 1:5 in 45% ethanol with a dose of 1-2 mls. ~ In latter years more than 295 compounds have been isolated in Skullcap, including some highly active flavonoids and diterpenes. Studies show that Skullcap and its active principles possess wide pharmacological actions, such as antitumor, anti-angiogenesis, hepatoprotective, antioxidant, anticonvulsant, antibacterial and antiviral activities. Test-tube studies have shown that Skullcap has a relaxant effect on uterine tissue and a survey of 60 patients with pulmonary disease (mainly pneumonia) compared Skullcap compound with a placebo and found it to be an effective treatment for over 70% of the patients who received the herb. 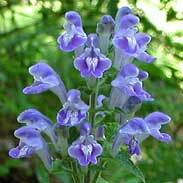 Skullcap is very safe to use, even in high doses, for the young and old and in pregnancy and breastfeeding. In fact it was widely used by the Eclectic physicians of the 18th and 19th centuries for various female disorders in both pregnant and non-pregnant women. I have noticed in my own clinical use of Skullcap that strong doses, especially with the tea, can have quite a striking calming effect on the mind of agitated individuals. This is obviously the point of using it but for someone who is not used to this kind of effect (and may be expecting a rather mild action) this can be something of a shock to the system! I have repeatedly seen that if Skullcap is used wisely then it is profoundly relaxing and I have found that it is especially helpful for anxiety associated with a restless mind. 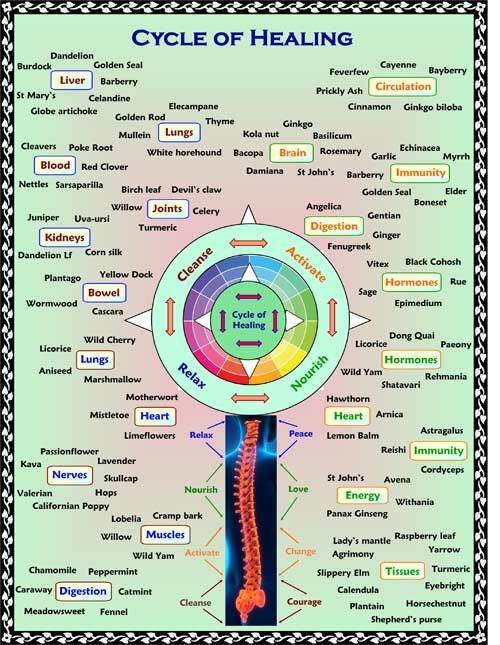 If you who are reading this are studying herbal medicine or perhaps have your own reasons to want to know this great plant ally at a much deeper level then I warmly encourage you to obtain some good Skullcap tea or tincture and then, with an open and attentive mind, take a dose of it and observe how it makes you feel. I have done this with people who are quite unused to herbal medicine as a way to gently introduce them to how potent, and pleasant, they can be. You can observe in a matter of a few minutes how a person who has taken Skullcap looks happier and palpably more relaxed. Once you have learned for yourself, or seen in others, how great a relaxant remedy we have with Skullcap then you will be better ready to use it than what any amount of academic study could prepare you for. I have given Skullcap to thousands of people over the years I have been in practice and it is one of the herbs that I have learned to deeply trust for a reliable calming action on an agitated mind. 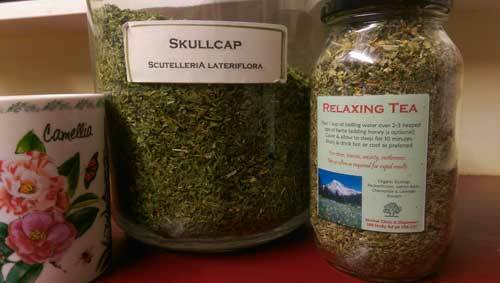 Skullcap forms one of the key ingredients in a formula I use for anxiety (more information about that here) and it is the best remedy I know for people who just can't slow down their thoughts! Don't think that Skullcap is some kind of drug-like tranquiliser though. Its effects are much more subtle and accumulative. It is unwise to use any substance, natural or pharmaceutical, to bludgeon the mind into quietness because there will be hell to pay for it later! 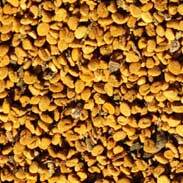 Skullcap is certainly suited to long term use and will not create dependency or lethargy in the user. Over a period of about a week you can visibly see the reduced agitation in a person taking Skullcap. It is one of our best allies in the modern world when we are beset by stress and stimulation whilst our minds and bodies crave some inner peace. I find that Skullcap tincture is excellent and that around 1-2mls in a dose is enough for most people to noticeably feel its effects and that taking this amount 2 or even 3 times in a day is ideal to help create a lasting shift in tension levels. One thing you should know though and that is that it can be hard to get good quality Skullcap, so you should take care to get it from a trusted source. 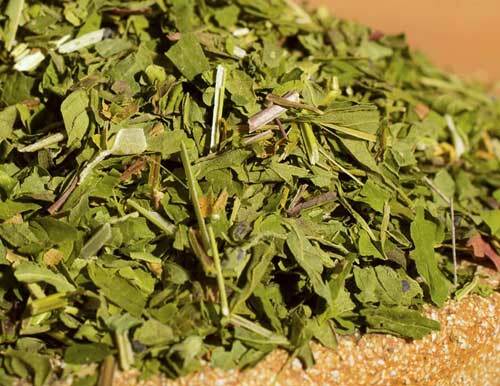 Skullcap works particularly well as a tea and aside from getting it from a trusted supplier the best way to know if your Skullcap is good quality is by the colour of the leaves which should be a vibrant deep green. As Skullcap ages the leaves lose their colour and the plant loses its potency. 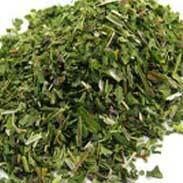 I have a recipe for a relaxing tea with Skullcap below that gives an effective dose of this great herb in dried form. 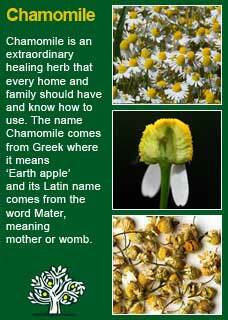 The above amounts make 100gms of herb, enough for at least several weeks of daily use. They are given to show the proportions so of course you can make more or less according to your preference. The dosage to have a pronounced effect is about 2-3 heaped tsps. to one large cup of boiling water. Cover the cup or whatever you are using for a good 10 minutes, then strain and drink. Adding some honey may be welcome. The taste of this tea is very acceptable and I have had great feedback over the years of using it from many hundreds of people who say how much it helps them to unwind, relax and sleep better. 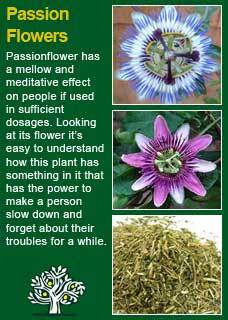 Skullcap combines perfectly with Passionflower for tension and anxiety, with Chamomile for digestive upsets and with Lemon Balm for moody or depressed spirits. Much of the information here about the traditional uses of Skullcap is consistent with the model of thinking whereby one may treat problem A with plant B. There is value in this approach, especially in how it helps us pass on useful knowledge to one another, but it falls short in one vital area; and that is that people are not all cut from the same cloth! Something that works brilliantly for one person may do less for another. Why is this? 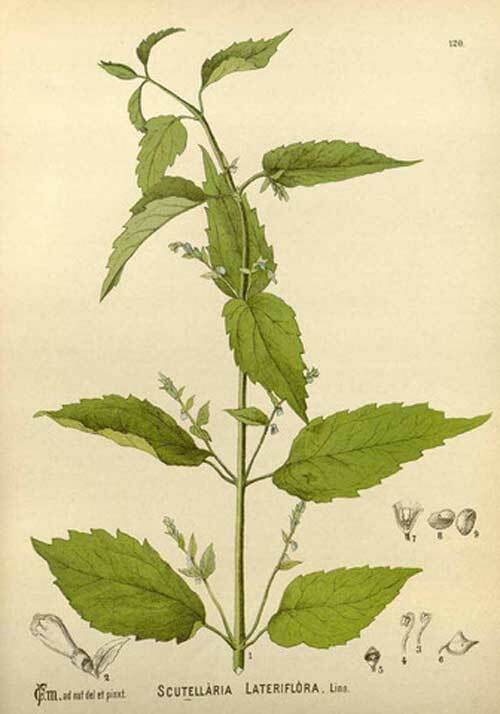 It has been observed a number of times that a person from one of the hotter constitutions is a lot more likely to quickly and strongly feel the relaxing effects of Skullcap,-even to the point it being quite sedative, whereas cooler constitutions can enjoy Skullcap and benefit from its longer term effects just as much, but are more likely to feel it as a tonic, restorative remedy.